RIDGEWOOD VETERINARY HOSPITAL'S FIRST MIDLAND PARK ADOPT-A-PET DAY! 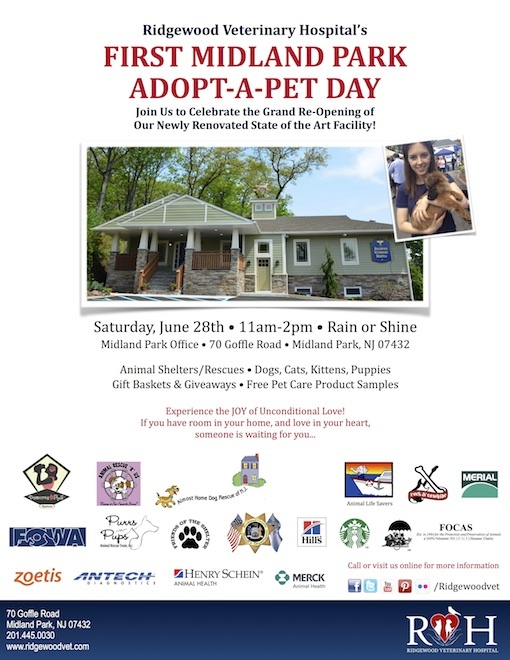 On Saturday, June 28th, from 11:00 A.M. until 2:00 P.M., the Ridgewood Veterinary Hospital will be holding its First Midland Park Adopt-A-Pet Day at 70 Goffle Road, Midland Park, NJ. This event celebrates the Grand Re-Opening of Ridgewood Veterinary Hospital's newly renovated state of the art facility in Midland Park. Dr. Cerf says, "There is nothing like experiencing the joy of a pet's unconditional love, and we hope to help as many pets as possible get a second chance to share that love." The hospital in Midland Park opens its doors and parking lot to 6-8 shelters and rescue groups this Saturday, who will bring dogs, cats, puppies and kittens for adoption. The entire staff of the Ridgewood Veterinary Hospital is passionate about this cause and will volunteer hours before and during the event to make it run smoothly. Keith Harris, Hospital Administrator, says, "Our slogan is ‘Open your heart and home to a friend for life,' and we invite people to help us adopt more pets at this event than ever before."